-- Edge and the Four Horsemen (Ric Flair, Arn Anderson, Tully Blanchard, Barry Windham, and J.J. Dillon) were announced as the headliners for the 2012 WWE Hall of Fame class. -- This week's Raw episode was dominated by the latest chapter in the John Cena-Kane feud. Kane appeared in the majority of segments on the show either in-person, via video replay, or "lurking in the background." Raw concluded with Kane standing tall after taking out both Cena and U.S. champion Zack Ryder in the parking garage area. -- After months of teases, Brodus Clay returned to TV as a Flash Funk-inspired character hailing from Planet Funk. Clay wrestled the same squash match routine as his Superstars run in mid-2011, but with gyrations and dance moves. In the following segment, WWE proudly boasted that "Brodus Clay" was the #1 trending topic on Twitter. -- Week 2 of Chris Jericho's TV return consisted of no talking and even more mock babyface actions, including fake tears, pounding his chest, and being so overwhelmed that he could not speak. 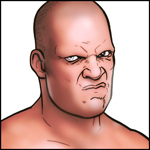 -- Announced for this week's Smackdown is World Hvt. champion Daniel Bryan vs. Big Show for the World Title in a No DQ, No Count-out match. -- One match announced for next week's Raw is U.S. champion Zack Ryder vs. Jack Swagger for the U.S. Title. Swagger lost to WWE champion C.M. Punk in a non-title match this week. -- One new item for the Royal Rumble PPV is Vickie Guerrero and Swagger will be banned from ringside for Punk vs. Ziggler for the WWE Title with John Laurinaitis as special referee. -- Concerning the Royal Rumble match, WWE specifically announced Sheamus, Santino, Wade Barrett, and Jinder Mahal for the Rumble. -- In a new WWE Network plug, WWE advertised an interactive "Countdown" show, similar to ESPN's SportsNation show.